A pair of sharp eyes (Pamela of http://pamelahodges.wordpress.com)spotted something on my desk that she thought looked like a bear. 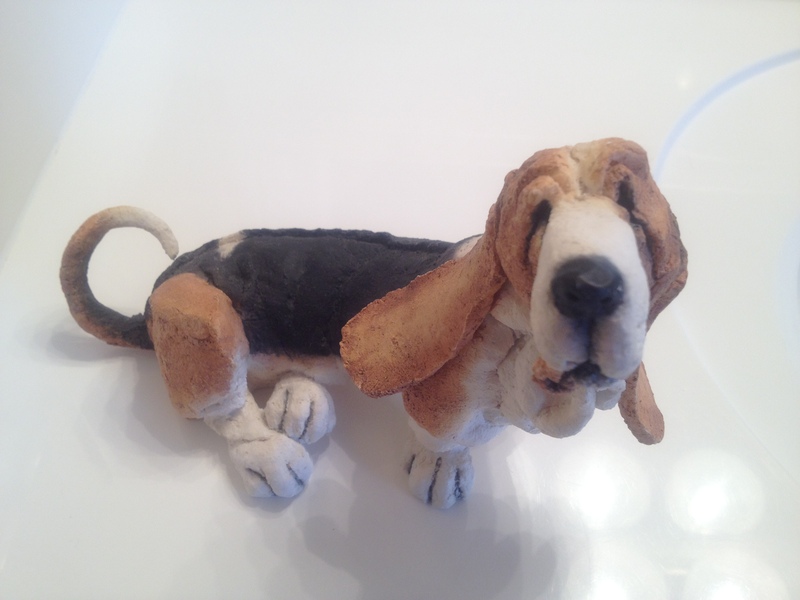 It’s not a bear, but a basset hound figurine. Here is her story. If we were planting something in the yard, Ohso would have to go for a walk. If she saw you plant it, she pulled it out when you weren’t looking. If she didn’t see it go into the ground, she wouldn’t bother it. Once in a while we would let her off the leash and in the yard outside the fence (we were on three acres). Somehow she always knew where another dog had deposited a treasure. She would run and start to eat it. Yuck! So the game was to chase her away from the droppings in the field. I don’t know who got more exercise, the dog or me. We got tired of the constant mowing of all those acres, so we decided to build a house in a subdivision with smaller yards. One day my husband came home and said I found a house and builder. Wes was the builder and when I found out he owned two bassets I knew we had a patient person to deal with us in the house building project. Wes was wonderful to work with, but it was his wife Cindy who fell in love with Ohso. If we were going out of town, Ohso went to their house to live a royal life with their other two bassets. I know Ohso was always sad to see us come home, because she had a much more comfortable life with Cindy. When we moved into our new house, Cindy gave us this figurine of a basset and it looked just like Ohso. Unfortunately, Ohso developed lymphomic cancer five years ago. She is not with us any longer. I still look at the figurine and see that silly girl, ears flopping as she ran around our field. I miss my girl! See, it's not a bear.